The Converse “Chuck Taylor” All Star is the classic American sneaker. Since its origins in the early 20th century, chucks had always been made in the USA, and so the anouncement in January, 2001 by the Converse Company that they were declaring bankruptcy and halting all manufacture of Chuck Taylors and other products in North America was upsetting to many people. The new owners of Converse are continuing to manufacture Chucks Taylor shoes but only overseas in Asia. In 2003, Nike, Inc. purchased Converse from the interim owners. What is the significance and importance of these changes? The basketball shoe is an American invention and yet almost the entire manufacturing base for athletic shoes is now elsewhere. For many years, the manufacturing of Chuck Taylor shoes continued to hold out against this trend, and was the only major name brand to still be made primarily in the USA. Many people bought chucks to support our American manufacturing base. Too many inventions developed in this country are no longer made here. Think for instance of the television set and the video cassette recorder. Most of the clothing items you buy in a store are no longer made here, also. 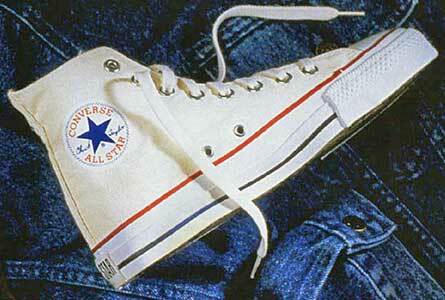 Now Converse “Chuck Taylor” All Stars have gone they way of these other products. When you purchase an American-made product, you are supporting American labor and not foreign sweatshops, where employees and even children labor for sub par wages on a quota system six days a week, and if they don't meet their quota they must work on Sunday to keep their job. Many people bought chucks to support American labor and because they are opposed to products made using sweatshop labor. Luckily, no reports of chucks being made in sweatshop conditions have emerged so far. If sneakers can be manufactured so cheaply overseas, why are they so expensive? Where does your money go? Unfortunately in many cases your money goes to hard sell advertising and endorsement campaigns, overpaid rich athletes, large corporate profits, and the commercialization of sports. For many people, purchasing and wearing chucks is a protest against the outrageous prices that come with the “latest” sneakers. The argument is often given that chucks are one of the best values in athletic shoes, due to their reasonable price. Do you think the manufacture of chucks in Asia will lower the price? Think again. The price is now around $55.00 retail, and many of the special seasonal models have prices of $60.00, $65.00, $75.00 or more. We live in a time and place where products from all over the world are easily available and many are selling at very low prices. While that has its benefits, it usually is not a reciprocal arrangement, and the US trade deficit is testiment to that. There are times when consumers want to spend their money to support the local economy, and it is important to be able to purchase products made here, if so desired. It's too bad that chucks have now gone the way of other sneaker brands. Well perhaps there is one small benefit, if you had the foresight to stock up on “Made in USA” Chuck Taylors. They continue to go up in value as collectors’ items.